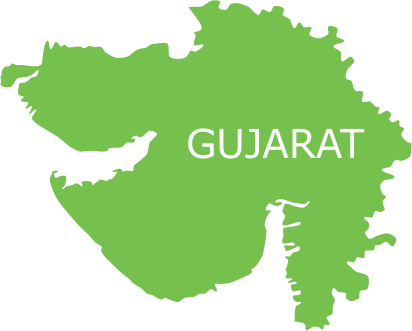 Home to a population of 4.47 million, Surat is the second largest city in Gujarat and a major hub of India’s textile and diamond industries. Employment options in its signature industries has led to a rapid influx of migrants in the city from all over Gujarat and other parts of India like Orissa, Rajasthan, Uttar Pradesh, and Bihar. As per the provisional figures of Census 2011, more than 10% of the city population lives in slums; however, this does not include a significant number of non-notified slums that have over 3.84 lakh households. Health assessment studies reveal that the total percentage of slum population in Surat is as high as 40%. These slum dwellers, living below the poverty line, are generally engaged in daily wage labour, domestic help, rickshaw/auto driving, rag picking and other unskilled/semi-skilled jobs to make a livelihood. However, overcrowding, congestion and unhygienic and dismal physical environment make living conditions grim for them. Lack of civic facilities like drinking water, garbage disposal, sanitation, drainage, and community toilets makes them susceptible to diseases like diarrhoea, dysentery, malaria, typhoid, dengue and pneumonia. Illiteracy, poor hygiene and lack of health-seeking behaviour further add to their vulnerability to health risks. Smile Foundation has partnered with Deutsche Bank in its mission to improve health conditions in the slums of Surat and sensitise their underprivileged people on health risks, their causes and prevention. 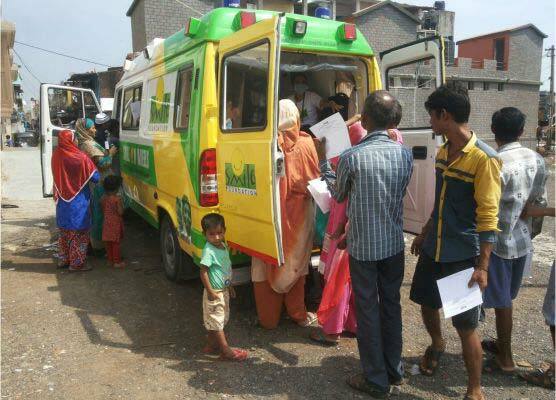 For the same, Smile Foundation has implemented Smile on Wheels mobile hospital programme in Kathor Village, Azadnagar Rasulabad, Chaprabhatha, Jadabawa, Abrama, Amroli, Utran, Goradra, Patelnagar, Kosad etc. The primary aim of this Mobile Health Unit is to deliver essential healthcare solutions to the underserved at their doorstep. With a team of medical experts and state-of-the-art equipment, this mobile hospital is equipped to provide medical consultation, diagnosis, medicines and lab testing facilities to the patients for free. Community mobilizers, on the other hand, take charge of communication interventions like group meetings, school health programmes, street plays, audio visual shows and health talks to spread awareness and enhance health-seeking behaviour in men, women and children. Special IEC activities are conducted for pregnant women to address health issues related to ANC/PNC, maternal and infant nutrition, breastfeeding and immunization. Besides dispensing preventive, promotive and curative health services, Smile Foundation also facilitates referrals for people with serious threats to health by linking to speciality services at the government health institutions or charitable hospitals close by. Targeting to reach around 1.25 lakh beneficiaries residing in 15 slums of Surat in a year. Free-of-cost medical check-ups, pathological tests and medicine distribution conducted through regular OPDs and special health camps. Regular IEC activities like street plays, community meetings and school health programs conducted to promote healthy living practices among families and children. Special focus on pregnant and lactating mothers through ANC/PNC and immunization services to decrease maternal and infant mortality rates. Referral services provided to patients to link underprivileged communities with the public healthcare system. 42 pathological tests were conducted so far.